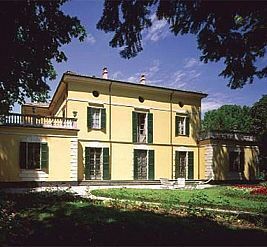 Three kilometres from Busseto, just across the Ongina stream, is Villa Verdi, the Maestro’s home in his old age. Despite not belonging to the province of Parma geographically, it is intimately linked to all the other Verdi sites in Busseto. 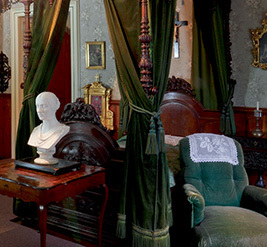 Its furnishings are intact and it is filled with Verdi relics. In May 1848, the Maestro purchased a farm in this village located in the province of Piacenza thus, in a certain sense, closing the circle opened up many years earlier. His ancestors were in fact natives of this small village, where they had been small landowners, tenants, and innkeepers since 1596. Construction of the villa began just after 1848 and continued up until around 1880 in fits and starts. Verdi’s parents lived in the villa until the spring of 1851; Verdi and Giuseppina Strepponi moved in immediately afterwards. The Maestro spent the rest of his life in the villa, with the exception of his Parisian sojourns and the winters spent in Genoa, looking after the management of the farm directly. The central building preserves the original structure of the farmhouse. Two wings with terraces were added onto the front of the villa, while greenhouses, a chapel and garages were added behind it. The villa is surrounded by a vast, romantic park filled with trees, including some of exotic origin. 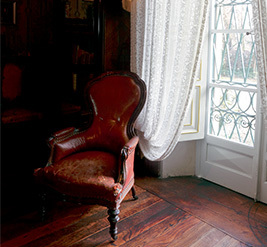 Of the villa, at present inhabited by the heirs Carrara-Verdi, one may visit the rooms located on the south side with its original Louis Philippe style furniture and other older pieces of furniture purchased by the Verdi couple. The first room belonged to Giuseppina Strepponi, the second to the Maestro. 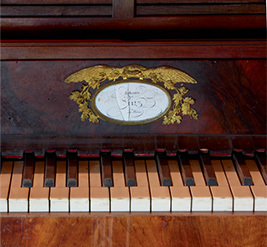 Among the most important relics are the pianos, the stucco portrait of Giuseppina as a young woman by Tenerani, Manzoni autographs, period photos, Verdi’s musical library, and many other profoundly evocative souvenirs. A masterpiece of 19th century Italian sculpture stands out from the rest: a bust modelled out of terracotta in 1872 by Vincenzo Gemito portraying a pensive Giuseppe Verdi. The sculpture renders his pride, his indomitable will, and his spirit of introspection and reflection to perfection in clay form. The bed from the Grand Hotel et de Milan where Verdi died on 27th January 1901 is in the room next to the changing room. Closed the weekends14/15 December, 21/22 December . Open every day from 26/12/2019 to 06/01/2020.